A few years ago I recorded Ron Hogan’s excellent modern take on Lao Tzu’s Tao Te Ching. 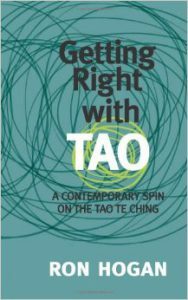 I came across his book ‘Getting Right With Tao’ by happenstance when I wasn’t really searching for it, which is when all the best discoveries are made. I’m a lover of Taoism and have been for years. It’s a simple, complex, huge and little concept all at the same time – the tao just is. I contacted Ron to ask if I could record it and he very kindly agreed. The thing I remember about the recording session – and bear with me because it was done years ago – was just how smoothly it went. The recording and editing was an utter joy. Ron’s book is a beautiful, simple, accessible piece of art that applies ancient wisdom to our crazy 21st century lives. The Boston Globe calls it ‘the ultimate guide to modern living.’ I hope my voice has done it justice. There are 81 parts. Sadly when I uploaded it, Soundcloud really wasn’t feeling the tao and wouldn’t let me create a single playlist of all 81 tracks. Sheesh! So the complete work is split over 3 playlists below. To buy Ron’s book, click here. To learn more about Ron, check out his website. Emma, loved what you have done with Ron’s work. As an admirer of his book for some time, it has been long overdue an audio verison. Wondering if you had thought of collaborating with him in order to release this on Audible? Just an idea. Anyway, thanks for taking it to another level. I, too, would like an audible version.